RAISE UR PAW NEWS: Heartbreaking Story - Owner Dies and Family Turns Away From Elderly Dog, who now sits in Shelter. Heartbreaking Story - Owner Dies and Family Turns Away From Elderly Dog, who now sits in Shelter. Imagine if a person you loved passed away, leaving you, a senior yourself not only alone, but unwanted by the family members of the person that loved you so dearly. 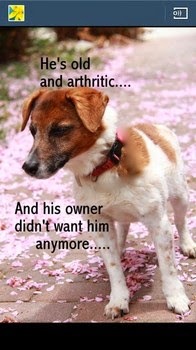 That is what happened to a Senior Jack Russell Terrier named "Taco," who is now homeless & housed at a Long Island, N.Y., animal shelter. This sweet baby, who is estimated at 12 years old, according to "Desperate Dogs of Long Island" facebook page. The family member who came to the shelter left without taking the senior baby back. "Found as a stray, his "Owner" came in a week later - he said Taco was his father's dog, and his father died. He then took one look at Taco, said "You can keep him" and promptly left. Taco now joins the list of many unwanted animals at the shelter, and he waits.. in a cage. According to the page TACO is indifferent towards other dogs, and due to his arthritis, a home with older children or adults is preferred. He needs a home without cats and this shelter also requires a meet and greet. Please RAISE UR PAW and HELP SAVE THIS INNOCENT LIFE.